Profiling is an important part of developing software, but its often overlooked during development. How many requests is my application making to my backend? What is the average time for these requests? How many SQL-statements is executed? What is the time for these statements? Is the statement (often generated by Entity Framework) a performant one? Can we adjust our backend code to produce a better statement? First, download MiniProfiler from nuget into your MVC-project (links to nuget packages found here: http://miniprofiler.com). Application_Start is excuted. MiniProfiler is set to profile all Entity Framework’s sql-statements. The MiniProfiler client calls the server on /mini-profiler-resources/results/ once per Id, this returns profiling from the MiniProfiler instance. Magic is displayed for your pleasure. 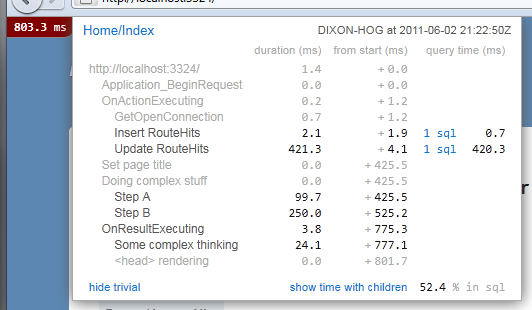 Adjust Global.asax.cs for all your WebAPI’s so that MiniProfiler is run in all applications (this is _NOT_ enough since MiniProfiler cant talk between applications). Change MiniProfiler.Settings.Storage to a storage where all applications can reach. This is our approach to solving the performance-questions specified at the start. So far so good! Hope you take the time to implement a similar solution to improve your applications performance, before release! I am working on similar prob. where my mvc web site and web api are is different servers . and I have to save all the profiled info into a database . can you please share your thoughts and if possible above working code example .